You can now share Instagram stories you find interesting, just like you share posts in direct messages, with your friends. Say you see someone’s story on the Explore page or your Feed which you like and want to share it with your friends, what do you do? There was no way to share them until now. But you can now share Instagram stories just like you share posts from your Feed as direct messages. Let’s us see how to share a story and change the privacy settings in case you do not want others to share your stories. Just go to the story you want. Tap the Direct icon in the bottom-right. Select the people or group to whom you would like to send. After selecting the people, tap Send. 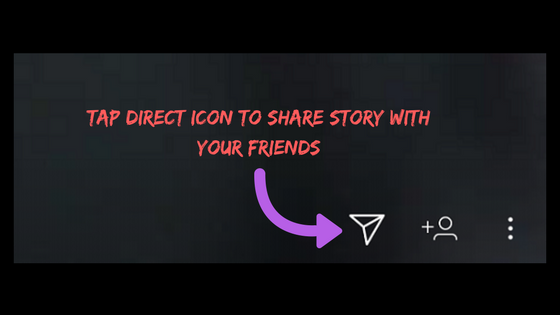 Tap the Direct icon to share the story. Stories you share in direct messages will be available only till the original story stays. When the original story disappears, the direct message also disappears. Tap three vertical dots (Android) or gear icon (iOS) in the top-right. Tap Story Settings under Account. Under Sharing, toggle off Allow Sharing. Go to Story Settings > Toggle off Allow Sharing. Keep in mind that if you have a private account, only your followers can see the story.